What is the Difference between 2:1, 3:1, 4:1, and 5:1 Pitch for Binding? A binding "pitch" refers to the hole spacing for a binding punch. There are several different pitches available, each of which is only intended for use with a specific binding style. A pitch is written in a ratio format with the number of holes, a colon, and the spacing that holds those holes. For example, 3:1 has 3 holes per inch. When reading a binding pitch, the colon symbol is read as a "to". For example, 3:1 is read out loud as "three to one pitch". 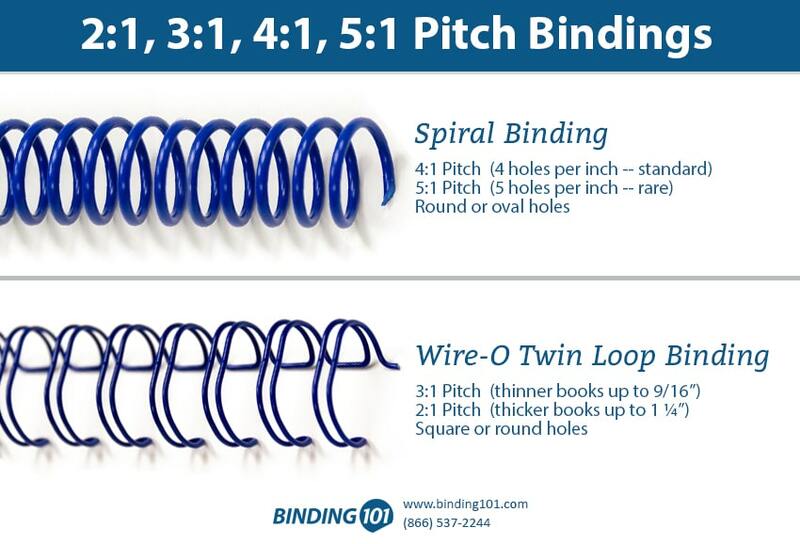 2:1 Pitch for Wire-O Bindings - Two to one pitch hole spacing is used for twin loop wire binding, also called wire-o binding. The wires are threaded through holes that are spaced with two per inch, so an 11" binding edge would have 21 holes, depending on the end-sheet page margins. 2:1 pitch spacing is used for larger diameter wires from 5/8 to 1 ¼", which looks nice with the wide spacing. Sometimes special smaller diameter wires also come in a 2:1 option, but users usually prefer the tighter spacing of a 3:1 in those cases. 3:1 Pitch for Wire-O Bindings - Three to one pitch hole spacing is used for twin loop wire-o binding as well. With three holes per inch, they are spaced a bit closer together and used for smaller wire diameters from 1/4" to 9/16". 3:1 pitch on a letter size paper will have 32 loops or 32 holes. 4:1 Pitch for Plastic Coil Spiral Bindings - Four to one pitch hole spacing is used for plastic coils, also called spiral binding. With four holes per inch, this tighter spacing works well with the continuous loop of a spiral bind. This standard spacing works with all coil sizes, industry wide. So you can make tiny 6mm coil books or huge 50mm coil books with the same hole spacing. 5:1 Pitch for Plastic Coil Spiral Bindings - Five to one pitch hole spacing is also used for plastic coil spiral binding, however, is a more rare spacing that is primarily used by specialty print shops with the proper equipment to punch five holes per inch. As you can imagine, those holes are very tightly spaced.